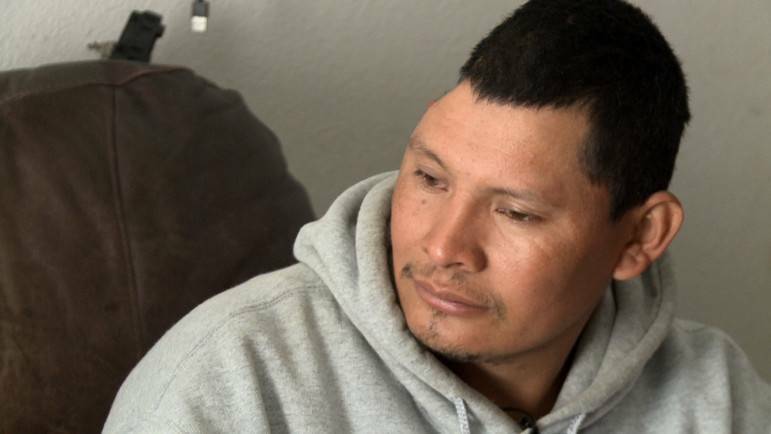 Eduardo Franco Ramirez was attacked so viciously by muggers near his home in Aurora in September 2013 that the police on the scene thought he had died. The Guatemalan construction worker was rushed to the emergency department of the University of Colorado Hospital, less than a mile away. Doctors there saved his life. They removed a quarter of his skull to relieve brain swelling, and cared for him during his 16-day coma, and more than a week after that. And then he was discharged. Franco was told to return for surgery to reattach his bone after his brain had a chance to heal. And that’s when his trouble deepened. Franco is an undocumented immigrant. Without insurance or a large amount of cash, he had no way to pay for the surgery he needed to reconstruct his skull. Left out of health care reform and ineligible for Medicaid, undocumented immigrants have few options for coverage, and are dependent on charity care from hospitals for urgent medical needs. Accessing expensive specialty care can be daunting in the best circumstances. The expansion of Medicaid and private insurance have swelled wait lists and strained specialty clinics, while high co-pays and deductibles can add up quickly. For those who remain without insurance, the barriers can be even higher. State laws require that each institution’s financial assistance policies be posted publicly, and that hospitals offer discounted care to low-income patients. But the policies are sometimes opaque, and fraught with loopholes. A 2012 law intended to provide charity care to uninsured patients, for example, only applies to patients in emergency care or admitted to hospitals – not those seeking admission for surgery or follow-up care, says state Sen. Irene Aguilar, D-Denver, a physician who pushed for the expansion in discounted care. But none have it harder than undocumented immigrants when it comes to accessing low-cost specialty care. The state health insurance exchange only sells to legal residents, and insurers often have their own restrictions. Meanwhile, a confusing raft of state and federal laws and hospital policies can conspire to shut people like Franco out from even what charity care is available. Dr. Jim Williams heads a safety-net clinic in Westminster called Clinica Colorado. He primarily serves uninsured patients, many of whom are undocumented. Most of them need no more than the primary care available at Clinica Colorado. But when Williams has patients who have suffered trauma from a fall, for example, or need dialysis, he struggles to find specialty care for them. He has found Exempla Saint Joseph Hospital to be a willing partner in offering his patients surgery or other specialty care at discounted rates. But Saint Joseph’s can’t always help. Except in emergency cases when a patient is likely to die within 24 to 48 hours, undocumented immigrants over age 18 are excluded from most charity care at University Hospital. The ban makes University different, even in the realm of restrictions, caveats and limitations by other hospitals. The general exclusion – which does allow for public health services including immunizations and prenatal care – is a result of a 2006 state law that restricts the use of public benefits for undocumented immigrants. Because University Hospital’s doctors are on the faculty of CU School of Medicine, their charity services are defined as a public benefit. “We are prohibited by the state from doing any non-emergency care for undocumented patients,” says Christina Finlayson, a surgical oncologist put forward by University Hospital as a spokesperson. She said the law puts doctors there in a bind. The restriction can play out in cruel ways, for doctors and their patients. Aurora grandmother Luz Macias, an undocumented immigrant from Mexico, had already visited three different metro-area emergency rooms when she showed up for a specialist appointment at University Hospital on Dec. 16. During those ER visits, three doctors had told her that she had an ovarian tumor, given her prescription medication to address her crippling pain, and advised her to seek a diagnosis and get the tumor removed. Finally in the door at University Hospital, Macias was weighed, given a flu shot, and then told the bad news: Because she didn’t have insurance or ability to pay, there would be no visit with the gynecologist. No diagnosis. And no surgery. The hospital declined to comment on Macias’ case, citing patient privacy laws, but reiterated that undocumented immigrants are ineligible for charity care under state law. Some critics question the hospital’s policies. University Hospital is an independent non-profit with its own stream of private funding – and administrators frequently point out that it is not the state-supported institution that its name implies. Joan Fitz-Gerald, a former Democratic state senator, co-sponsored the 2006 bill limiting the use of public benefits for illegal immigrants. She believes University Hospital’s use of the law to deny charity care is a stretch. “This interpretation is pretty much beyond the boundaries of what we had envisioned,” says Fitz-Gerald. Given the hospital’s access to non-state funding, “They could figure out to be more comprehensive if they so choose,” she said. Hospital spokesman Dan Weaver stood by University Hospital’s interpretation of state law, saying that the hospital is defined as a “political subdivision” of the state, and its doctors are supported in part by state funds. Other hospitals in the state aren’t bound by the same rules. Still, access at those hospitals can also be daunting. Denver Health, for example, does provide charity care to undocumented immigrants. But patients have to be residents of the city. Macias, the woman with the ovarian tumor, eventually found help. But it wasn’t simple. With support from her church, she found her way in late December to Caritas Clinic, a safety-net clinic affiliated with Saint Joseph Hospital. They were booked until April, they said, news that brought Macias’ grown daughter, Adriana, to tears in front of the receptionist. At that very moment, a patient called to cancel an appointment. A week later, surgeons at St. Joseph removed her tumor, which turned out to be benign. Franco has not been so lucky. Now a year and a half out from the assault, his life has shrunk down to his bare apartment on 16th Avenue. He wears a cheap white bike helmet to protect his head. Beneath it, his black hair has grown over a dent the size of a man’s fist. He takes the helmet on and off compulsively, his thick hand creeping to the soft spot. “I am frightened,” says Franco. His vision has been fading. Without the surgery, he can’t work to support himself or his family, including a four-year-old daughter who is paraplegic. And returning to Guatemala is out of the question. Rich McLean is a parishioner at St. Therese Catholic Church in Aurora and an activist for Together Colorado, a faith-based organization that advocates for social justice. He helped Macias find her miracle, and is seeking another one for Franco. He’s trying something new this time: a crowdfunding site called GiveForward. If the crowdfunding effort raises $20,000, University Hospital has agreed to pay the remaining $60,000 or more that the surgery will cost. Dr. Aviva Abosch, a CU neurosurgeon who helped care for Franco, wrote a letter that is posted at GiveForward, explaining that without the surgery, he is in grave danger of further injury, paralysis and death. The hospital declined to comment on Franco’s situation, citing patient privacy laws.